Pros: There is powerful relationship drama in parts and some strong acting that carries the momentum of the play. Cons: The emotional weighting of the play is clunky and the direction is baffling at times. This is a relationship drama that veers too often into the realm of soap opera. Possibly with another draft or two it will find a more natural shape and set its focus where it deserves to be. An aspirational Liverpool family’s peace is shattered by the arrival of a troubled 17 year old whose mother has just died. What is worse is that Scott (Ryan Blackburn) isn’t grieving as he should; he didn’t cry when they cremated his mum’s body and now her ashes have gone missing. As Scott tries to fit in with his new family of mum and dad Lisa and Daniel (Catherine Harvey and Paul Regan) and their nerdy only child Leo (Greg Fossard), problems arise instantly. There are class differences, endless hormones, deep-hidden family secrets and worst of all, Scott’s pet snake. 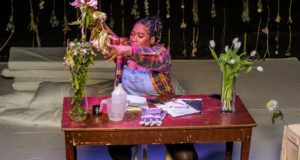 What follows is a haphazard hour and 45 minutes of engaging and lively new writing with a strong sense of family on the stage. However, the play never quite flows and is hindered by some strange and stilted directorial decisions. Author Dameon Garnett creates a lively and vibrant family dynamic. 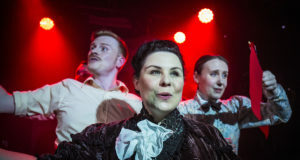 The chaotic buzz of the household environment is felt particularly strongly thanks to the round setting of the Finborough Theatre, where family members fly off and on from different corners of the stage. This is also aided by a standout performance by Fossard as the much loved son of the family who has to share his parents’ love with the awkward new arrival. However, the peaks and troughs of the play do not sit naturally at all. A lot of the crucial arguments build up too quickly, explode with emotion from nowhere and then keep on going until it hurts. Then, when you are craving for a catharsis and a direct resolution of the poignantly raised issues, the tension just ends out of nowhere. Garnett engages with the subject of grief very well for some of the play but this focus is subsequently lost. Most of the energy then revolves around a contrived and unnecessary twist in the second act (one which is given away on the back of the programme anyway). This twist is what pushes the entire piece over the boundary from relationship drama to onstage soap. Emma Faulkner’s stylistic direction revolves around Bethany Wells’ movable and adaptable set piece. Four movable units are shifted and rotated between scenes to differentiate between rooms in the house. Unfortunately this only makes matters confusing as sometimes the set changes when you feel that the action hasn’t moved location and then doesn’t change when the action is clearly in a different room of the house. We are also left confused by the placement of the actors who are moved offstage when they are not meant to be in the room, yet sometimes appear onstage when they are clearly out of the room. Nevertheless, it is still very early days for this piece and there is no reason why, with some rethinking, it cannot evolve into something strong.